The R-PLEX Human SCFR/Kit Antibody Set includes a matched capture and detection antibody pair and calibrator for the quick and easy measurement of SCFR/Kit in biological samples. R-PLEX products leverage MSD’s electrochemiluminescence technology for better sensitivity and a larger dynamic range than traditional ELISAs. R-PLEX matched antibody sets enable the development of singleplex and multiplex immunoassays. Individual assays may be developed using MSD avidin- or streptavidin-coated plates. Custom multiplex assays with any combination of R-PLEX analytes, as well as R-PLEX plus U-PLEX analytes, can be developed on U-PLEX MULTI-SPOT plates. To learn more about the advantages of R-PLEX products click here. 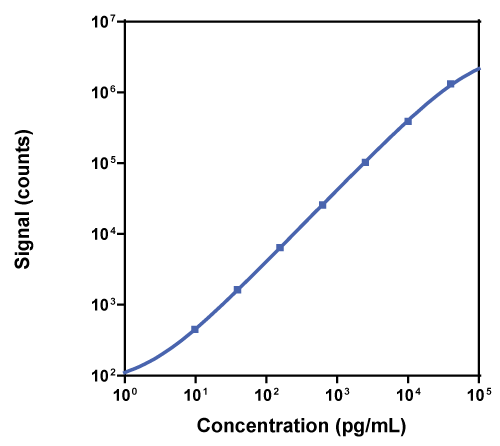 Calibration curve for the R-PLEX Human SCFR/Kit Antibody Set was assessed and representative data are presented below. Description - Stem Cell growth Factor Receptor (SCFR, Kit, c-Kit, CD117, PBT) is a receptor tyrosine kinase that binds mast cell growth factor. It is expressed mostly on the surface of hematopoietic stem cells. SCFR/Kit activates pathways that influence cell survival, proliferation, and differentiation. SCFR is a proto-oncogene that drives the development of certain leukemias and gastrointestinal stromal tumors (GISTs). Activation of SCFR can be used to mobilize hematopoietic cells to elevate cell counts. Tetrathiomolybdate-associated copper depletion decreases circulating endothelial progenitor cells in women with breast cancer at high risk of relapse. Placental Growth Factor and Soluble c-Kit Receptor Dynamics Characterize the Cytokine Signature of Imatinib in Prostate Cancer and Bone Metastases. Phase 1 study of the investigational, oral angiogenesis inhibitor motesanib in Japanese patients with advanced solid tumors.